The concept of concessioner's licenses in parks came about with the introduction of the railway. The parks service could not adequately provide for the growing tourist base but also wanted to regulate the business that could be provided by private companies. In protected areas such as the parks, the idea of concessioner's licenses came about. One concessioner would essentially hold a monopoly on the services in the park. 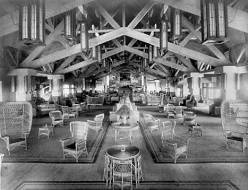 For the south rim of the canyon, it was Fred Harvey. For the north rim, it was the Utah Parks Company. A close relationship was formed between the railroads who often also employed the concessioners, the concessioners themselves, and the park service. There was a mounting hostility between individual businesses and the concessioners over time as pressure rose to leave the canyon. The pioneer families that held onto their claims of the land were threatened by the corporate/government alliance that had formed. Regardless of the bad blood between the two, concessioners have ensured reliable service throughout periods of economic uncertainty and have had the ability to vastly improve amenities due to larger budgets. It is a symbiotic relationship between concessioners and the park service and it is one that continues to thrive. 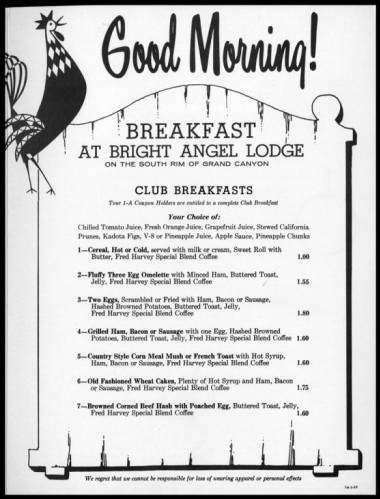 El Tovar Hotel and Bright Angel Lodge Menus.